Welcome to the British‐Ukrainian Law Association. Establish a forum for lawyers from the United Kingdom who wish to be involved in and with Ukraine and vice versa. The Association is managed by a Committee whose powers and duties are set out in the Constitution. The British-Ukrainian Law Association was founded in 1993, with the inaugural event held on 16th February 1993 in the Queen’s Room, Middle Temple, London. It was attended by the Ukrainian Ambassador to the Court of St. James, His Excellency, Serhiy Komissarenko. The Honorary President of the Association was from its inception until his sad death on 9th October 2015 the distinguished former Deputy Prime Minister and Secretary of State for Foreign Affairs, the Rt. Hon. Lord Howe of Aberavon, CH, QC. We have been fortunate to have had the continued patronage of the Ukrainian Embassy and in particular the second ambassador to the Court of St. James, His Excellency, Professor Volodymyr Vassylenko, also a distinguished lawyer, who went on to give distinguished service as a judge at the International Criminal Tribunal for the Former Republic of Yugoslavia in The Hague. The first Chairman of the Association was Richard Behar. 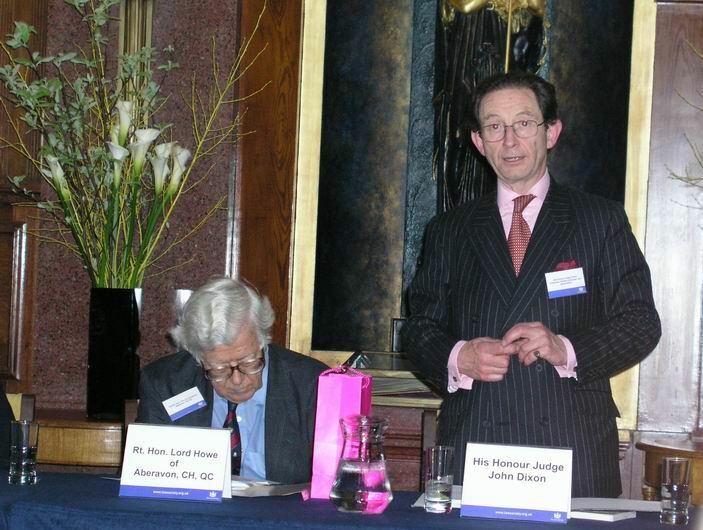 On his appointment as a Judge, John Dixon, later His Honour Judge Dixon, took over as Chairman from 2001 until his sad death on 12th August 2014. He was followed by Alexander Walsh and then Yuri Botiuk who did an enormous amount of work to expand the membership and activities of the Association, particularly in Ukraine. The current Chairperson is Eugenia Rebotunova, who had previously expertly managed the expansion of the Association as its Secretary. The AGM of the Association on 11 October 2017 at the law offices of Bryan Cave was honoured by the presence of Her Excellency Mrs Natalia Galibarenko, Ambassador of Ukraine, who addressed the meeting on the importance of support for the rule of law and democracy in Ukraine and briefed members on the judicial reforms. She asked the Association to work with the Embassy and contribute to the judicial reforms.